If you are in Newcastle-upon-Tyne then feel free to visit a number of sites linked to the life of Robert Gilchrist. Six key sites are listed here. 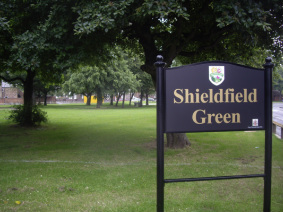 Robert lived at Shieldfield Green in the quaint 17th century house said to have been used by Charles I (while a prisoner in Newcastle in 1646/47). Robert was involved in an attempt to save the house from developers in 1838 and wrote a poem addressed to Mr Clayton, the Town Clerk, whose plans for redevelopment threatened the house. It was spared. The house was unfortunately demolished in the 1960s following the redevelopment of Shieldfield. King Charles Tower now looms over the site where the house stood. A plaque originally affixed to the building is preseved on a plinth in the newly renovated green. Notice how the name of the local poet overshadows the monarch. 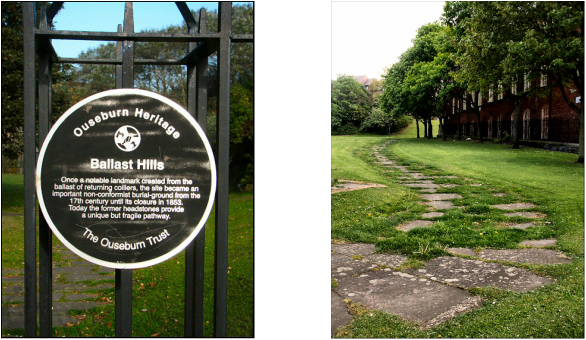 Ballast Hills Burial Ground is located off Ford Street, Ouseburn. This was a resting place for religious dissenters, non-conformists who did not want an established church funeral service in a parish churchyard. The cemetery was closed in the 1850s and a public park was created 40 years later with remaining gravestones used for footpaths. Although there is no gravestone to Robert Gilchrst, he was buried in the cemetery in 1844, aged 47. 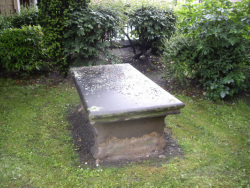 Enter St John's Churchyard, near Newcastle Central railway station, and you will find towards the rear an inscribed monument which covers the grave of the pastoral poet John Cunningham (1729-1773). 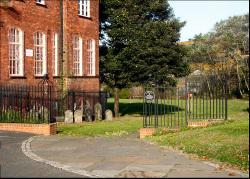 St John's Churchyard was noted for its 'poets' corner'. Unfortunately, apart from John Cunningham their memorial stones are now missing. They include two contemporaries to Gilchrist - William Watson (1796 - 1840) whose many songs included 'Dance to the Daddy', and timber merchant and songwriter Thomas Thompson (1773-1816), who was a mentor to Robert. 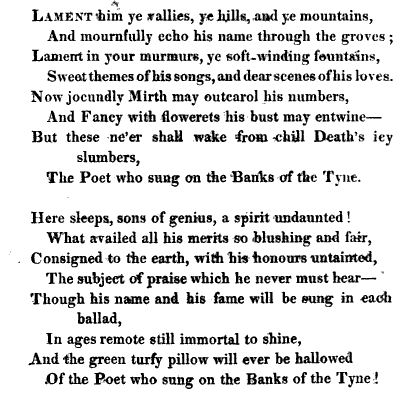 Gilchrist composed a sentimental eulogy to Thompson upon his death in 1816. 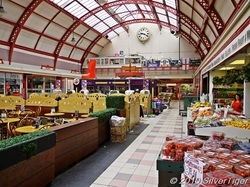 The event was held to celebrate the opening of this new commercial centre as Newcastle underwent development during the 1830s through the efforts of builder Richard Grainger. 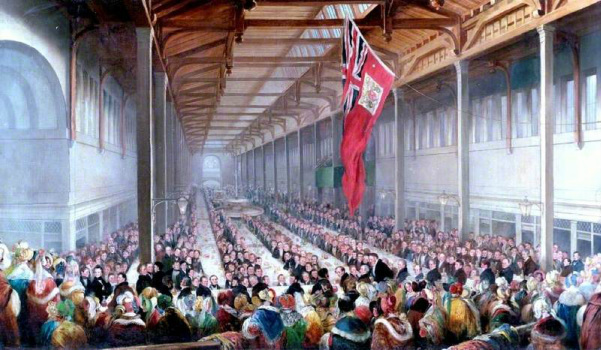 A public dinner was held in which nearly 2,000 were present, including 300 ladies in a temporary gallery erected for their accommodation and that of the band. The Newcastle Journal noted that Robert Gilchrist “sung with great applause”. 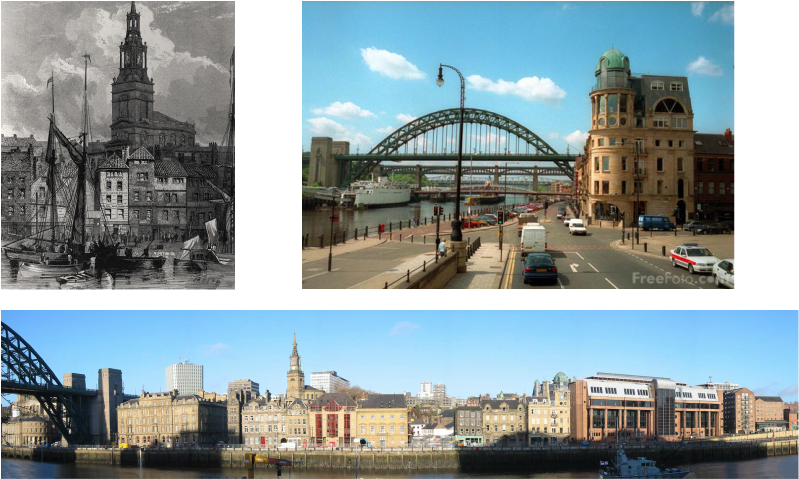 His song, unnamed at the time, but which would appear in Joseph Robson’s Songs of the Bards of the Tyne as ‘Song of improvements’ was posthumously published in a shorter form entitled ‘Anti-antiquarianism’, which dealt with the redevelopment of Newcastle’s upper town. A painting to commemorate the event was produced by Henry Perlee Parker. The family sailmaking business was located at 38, Quayside, and the premises stood close to where the Custom House is now situated. It is likely that the building succumbed in the Great Fire of Newcastle and Gateshead in 1854. All of Robert's sons were apprenticed to be sailmakers and his brother-in-law, Henry French Morrison, served as Robert's apprentice and continued to trade as a sailmaker and sail cloth salesman into the second half of the nineteenth century. The 'kee' was once home to some of the liveliest character of Georgian and Victorian Britain. Robert wrote about a number of the quayside folk in his songs. The annual Barge Day event, a local custom in which the Mayor and barges representing the Town's Guilds sailed the length of the Town Corporation's boundaries on the Tyne on Ascension Day, was an important occasion to express pride in profession and place. 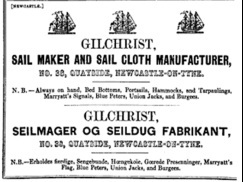 As a steward of the Incorporated Company of Sailmakers, Robert Gilchrist had a prominent role in the town’s ceremonial and ritual. He is credited as being at the forefront of the Steward’s steam-packet and performing especially composed songs on the barges as they sailed the Tyne and at the celebratory dinners that followed. Robert married Margaret Bradley Morrison at All Saints' Church on 15 November 1823. 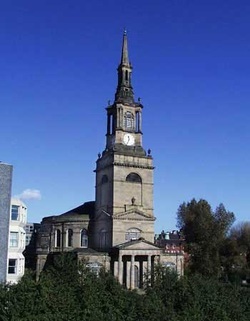 The church is a late 18th century elliptical church located in Lower Pilgrim Street. Robert, however, was a non-conformist. He was a member of the Glassites. This was a fundamentalist, communitarian religious sect that sought the re-establishment of the ‘primitive Christianity’ of the New Testament, following the examples set by the Apostles. It emphasised individualism, moral principles, rationalism and anti-clericalism. Famous Glassites (or Sandemanians as they were later termed) in the nineteenth century included the scientist Michael Faraday, the political philosopher William Godwin and the English watercolourist James Baynes. The Glassite community, one of the smaller non-conformist congregations in Newcastle, based around the Forster Street Meeting House, had existed in Newcastle since the 1750s and prominent members had included the Spence family, including the political radical Thomas Spence (1750-1814) who proposed a form of land nationalisation. The Glassites felt that faith alone, not deeds, were the key to salvation and that The Bible enjoined people to be loyal to their rulers, and emphasised the importance of civic and religious freedom. Gilchrist was elected to the Board of Guardians in 1836, representing the All Saints' Parish, which administered the Poor Law. This area was described in an 1834 report to the House of Commons as the “most populous and heavily burdened parish” in the town, “terribly infested” with poor Irish immigrants. As a Guardian of the Poor, Robert would have to adjudicate between deserving and undeserving poor, deciding on the fate of unfortunate individuals and families as they entered the newly constructed Newcastle Workhouse.